"In the economic game Port of Piraeus, you are one of many prudent and provident merchants who have come to the Port of Piraeus from all over the world to sell their goods and purchase overseas items. Every decision you make will inevitably influence the market and either simplify or complicate the game for your opponents. 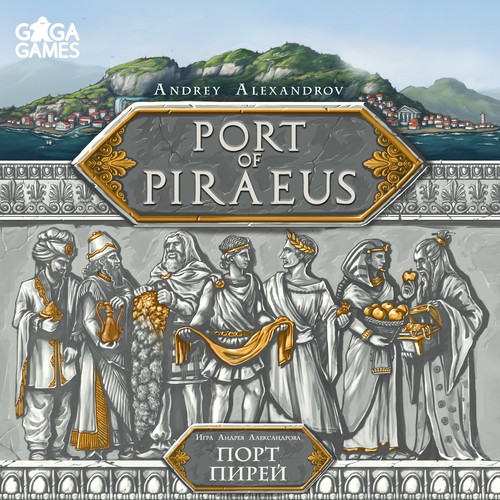 Act carefully, trade proficiently and become the most successful merchant in the Port of Piraeus! Players become merchants from different countries who are trying to make money buying and selling different commodities. There are eight trading days in the game, and each day players get to choose whether they want to buy other merchants’ products or sell their own. The prices for different products will keep changing depending on the situation. When they arrive back home, each merchant will get a good price for all the goods they buy here! The player who earns more money by the end of the game becomes the winner." 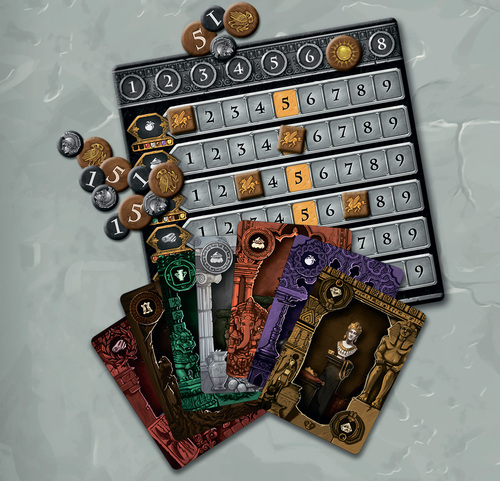 To set up Port of Piraeus each player takes a deck of goods cards in the color of their choice, the buy/sell token of the same color and 10 Drachma. The market board is placed in the center of play with the six price markers all set to five and the day marker placed in the one position at the top. The Greek goods deck is shuffled and placed face down next to the market board and the remaining Drachmas are also placed to the side of the market board. Start of day. Players begin the round by drawing three Greek goods and placing them below the market board. Planning the day. Players then secretly choose if they will be buying or selling on this day. To do this they place their buy/sell token on the table with the corresponding side up—covering it with their hand. Once everyone has chosen what they will do players reveal and the market is adjust based on the number of buyers verses sellers. Displaying the goods. Players who chose to sell will now select up to two cards to add to the market (above the market board). Prices are again adjusted up or down based on what the sellers played. Negotiation and selling. Players who chose to be buyers on this day will now place their markers on the goods they want to buy—either from another player or the Greeks. If there is more than one player marker on a good the owners of the markers will do a blind bid—highest bid winning. If there is a single marker on a good the owner of the marker pays the amount based on the market to either the owner of the good or the bank for the Greek goods. This phase happens three times giving a player an opportunity to buy three goods. End of day. Left over goods in the market are sold to the bank based on the market being paid to the player who owns the good. The good(s) cards are then discarded. Left over Greek goods go to the bottom of the Greek goods pile. The day marker is moved to the next day and the round is finished. This continues until the end of the eighth day at which time final scoring occurs. Scores are determined by the sets of goods that players have collected over the game. Players are trying to get sets of three or more of the same goods from different players (other than themselves) OR sets of three or more of different goods from the same player (other than themselves). For example player 1 (the Barbarians) has collected a fur from Persia, Egypt, and the Greeks making a set of three furs. Also player one has collected a spice, dishware, and fabric from the Chinese creating another set of three. There is a chart included in the rules that lays out the points for sets of three, four, five, and six. Players also receive six points for each stand alone good from another player and one point for each of their remaining goods. The players with the most points wins! Port of Piraeus is the trading game you have been looking for! 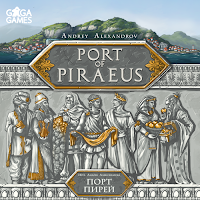 Port of Piraeus is dripping with theme as players take on the role of an ancient merchant from a distant lands coming to the Port of Piraeus to make their fortune. In conjunction with the mechanics the theme comes alive through every phase of the game. Each mechanic of the game is simple yet combined in such a way that works so well. Set collection, bidding, trading, and market fluctuation combined to transport the player back in history to a time of merchants, exotic goods, and eager buyers. The components for Port of Piraeus are solid. The game board and tokens are thick and easily identifiable. The cards are similar to those found in other GaGa games—thick yet soft and hard to shuffle. The good thing is you don't need to shuffle much in this game. The artwork is great, very thematic and clean. Card coloring could be an issue for color blind players. Game play, game play, game play. Did I mention the game play is good? Similar to GaGa's other titles this game is simple and solid. No unnecessary rules, components, or mechanics. 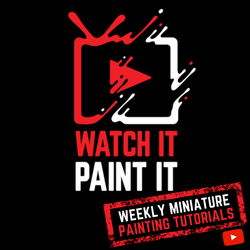 The theme, mechanics, and artwork come together to give players a very fulfilling experience. Since I have harped on it through the other reviews I might as well say it again here—the cards. I am not sure what is going on with them because they are so thick you would think they would be sturdier, but that is not the case. I am worried every time I shuffle that I am going to bend the cards. The mat finish also hinders shuffling. 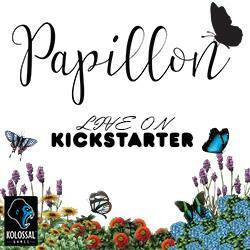 This is a great game for 3-6 players looking for a strong bidding/trading game. It will definitely be going into my collection and should see a good amount of time on the table. I am giving Port of Piraeus a 4 out of 5 super meeples!